Proper electronic file preparation is the key to a successful project. Our prepress department will carefully review every file you submit. Here are some file preparation tips to help make the process go smoothly. Please take a moment to review the following application specifications and tips. Indicate what program, platform, and version (if applicable) you are using for your files (e.g., "QuarkXpress 8.0 on Windows 10", "Adobe InDesign CC on Mac", etc.). This is very important information for us. It tells APi-marketing which computer to load the file up on and ensures that the job will reproduce exactly how you intended it to look. When saving a document in Portable Document Format (PDF) using Adobe Software, please download our Adobe PDF Settings (recommended). Although we do support these programs, try to avoid using Microsoft Word, Microsoft Publisher, and Corel Draw when creating files for eventual imagesetting - they can be problematic, because Microsoft does not reliably support color. Using these programs can lead to unexpected results. Please always check your linked files to make sure they are updated and have the same name that the layout program is looking for. Do not embed images. Save them with a link outside the document. Do not use Adobe Illustrator for lengthy multi-page documents. It is not as efficient as a page layout program and it takes longer for us to produce. The standard resolution for photo files is 300 dpi (used at the same size in the layout) for continuous tone images, and 1200 to 2400 dpi for bitmap line art. Do not enlarge images more than 150 percent or reduce them lower than 50 percent in your layout. Delete all extra channels and paths that are not being used in TIFF files. In Photoshop, when you save your EPS file, there is a "choice of preview" mode. Save your preview as a Macintosh 8-bit file, not as a JPEG file. Use Open Type (.otf) or TrueType fonts unless there is no alternative. Type 1 fonts are no longer supported by Microsoft and Apple. Provide both your screen and printer fonts. Avoid the use of the style menu to set fonts within a document. For example, use "B Helvetica Bold" rather than using Helvetica then bolding it. If you are using spot colors, print your document in separations as well as a composite before sending your job to APi-marketing. This will show you which elements of your document will print on which color plate, and can alert you to potential printing concerns. If your photo is a duotone, please be sure any PMS color used is named exactly the same in your Photoshop file as it is in your page layout program. Save all images and documents as CMYK plus any Spot Colors. Build your file to the exact document trim size. If there are bleeds, allow 1/8 inch on top, sides, and bottom. Do not build your layout into printer spreads. It is easier for us to impose reader single-page documents. A little white space goes a long way. While you might get caught up in fitting as much information as possible into your piece, some space with nothing in it makes your whole piece read easier. Limit the text on your piece to two or three fonts. You can even shake things up by using different fonts from the same typeface (Times New Roman, Times Bold and Times Regular, for example). You can also use color for impact, though limit the use of color to the more important statements. Boxes should be used with the same restraint as color. Limit it to important statements, pull-out quotes or sidebars. Headlines should be tied to the text they head. This means there should be little space between a headline and its text, and more space between the end of a body of text and the next headline. Reversed text is a great way to draw attention to, again, key statements. Proofread, proofread, PROOFREAD! Spell check is great but can only catch so much...it can not distinguish between form and from, or its and it's, for example. Reading, rereading and even reading your work aloud is always a good idea. Most default trapping gives you less than acceptable results. Unless you are experienced in setting trapping for colored items, please do not set individual element or global trapping. APi-marketing will handle all the trapping for your files. If you have specific trapping needs, please let us know when you submit your job. Once you have received a proof from us and have changes or revisions, please indicate all changes through our online proofing system. We can easily make minor changes and save you some money by not having to re-do any work we have already completed on the original file. If you must furnish us a revised file, please make sure that you have changed the file name so that we can distinguish between the original and revised files. However, keep the original name of any linked files so that the links remain active. It often comes up that the printed piece didn't match the color on the monitor or the desktop printer. We've heard that before. And we have a solution. It's an easy concept to explain, and almost as easy to solve! First, when you are printing in color, the four colors used are cyan, magenta, yellow and black. When these colors are printed they are called subtractive primaries. What is printed is the mathematical calculations in the file telling us how much of each of the four colors to use for each dot area. When you see it on your monitor, it is using red, green and blue, which are called additive primaries. The two processes are different and will never match. But you can get them close. 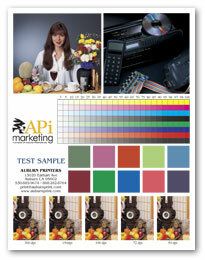 If using Digital Print Service, download our monitor test sheet to your computer, and contact us to send you a monitor test sheet printed on our Canon 7000VP Digital Color Press. Open the test sheet on your computer, and hold up the monitor test sheet we've sent you next to it. Using the controls on your monitor, adjust the monitor to match. Color calibrating your desktop printer is a challenge. They use a high-density rate for each of the four colors, which are opaque. Printing press inks, with the exception of black, are translucent. You will need to tone down the color of your printer and print out the test sheet until you get it close to the sample sheet we printed. Please be aware that even our Canon 7000VP digital press will not always match the color on an offset press, but will come closer than a desktop printer. Be sure that you provide ALL images used in your files. Double check your Adobe Illustrator files in particular. Even if you do a "collect for output" in QuarkXpress, it may only pick up the placed Adobe Illustrator file, and not its links. Provide lasers of your files and note if they are scaled down to fit the paper.